Say that three times fast! Today I’ve teamed up with my friends at Ryobi Canada and a little group of my favourite Canadian ladies to bring you some fabulous DIY ideas! I’ve been working hard on this project, and kinda proud of this bookcase because I built it 100% by myself. I’ve ripped apart and fixed up lots of existing furniture, but this Boy’s Bedroom Bookcase is the first piece of furniture I’ve tackled with no pattern, or help (yayy me, toot toot!). My initial intention with this post was to create a how-to tutorial… turns out I’m not Ana White. I have a lot to learn, then I’ll be Ana White, I better get growing my hair! What I can tell you is what I learned from building my first piece of furniture. 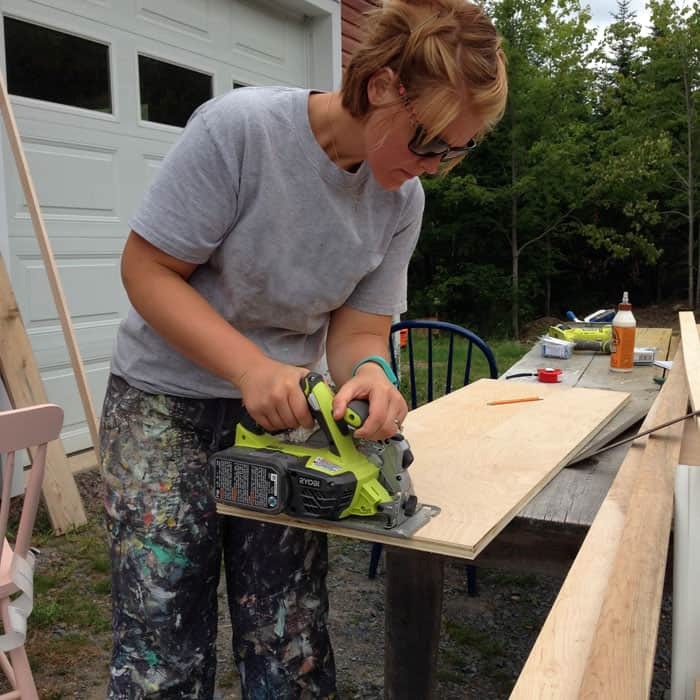 Grab a pen and paper, because I know you’re dying to rock a nail gun too! Good tools make the world of difference. Up until recently I’ve been using my husbands tools, some are old, ALL are heavy. The Ryobi One+ system is lightweight, not too big and intimidating, and all compatible with the same lithium-ion battery. For this project I used the 18V Airstrike Brad Nailer, the 18V One+ 6 1/2″ Circular saw, and the 18V One+Drill. 2. Have a second set of hands around. Lucky for me my neighbour popped by in the middle of my madness and helped out hold a few things for me. Before he arrived I was leaning things up against chairs and trying to juggle, not a good combination when you’re piecing things together. 3. Have the hardware store make the big cuts for you. I shopped for my plywood at the Home Depot. I had them rip the sheet of plywood to the right sizes for me, it made everything go a lot quicker and straight. Then you can make any small cuts with the circular saw when you’re home. I know, I know, I’m looking so sly in my best painting pants. 4. A good tape measure and square are essential. The tape I was using had a wobbly end, so it made my measurements off by a small hair. Not so good when you’re building furniture. 5. Read some tutorials (maybe A LOT of tutorials) before you start furniture building. It is very rewarding, but if you’re not a carpenter then you’ll need to talk to, and read from the pros. The folks at the hardware store are very knowledgeable also. 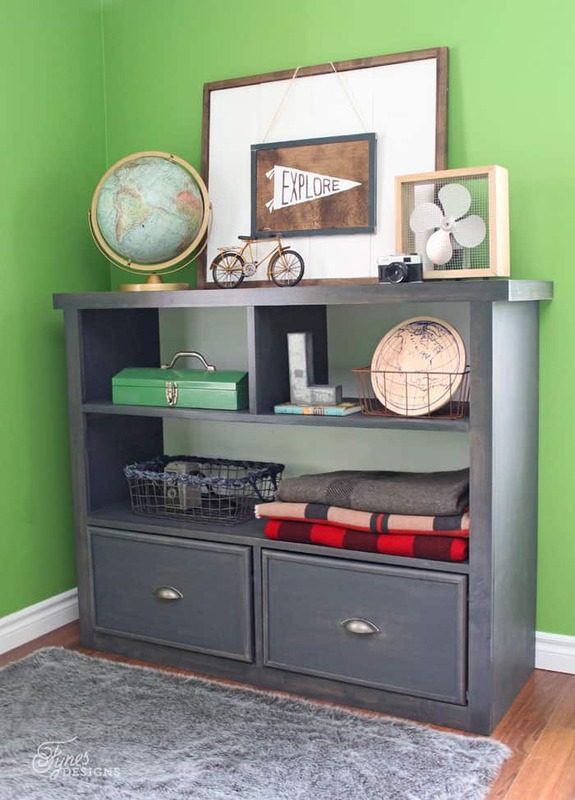 The tutorials that helped me out with this build were; How to install drawer slides from Shanty to Chic, and How to install drawer fronts from Designs by Studio C.
6. 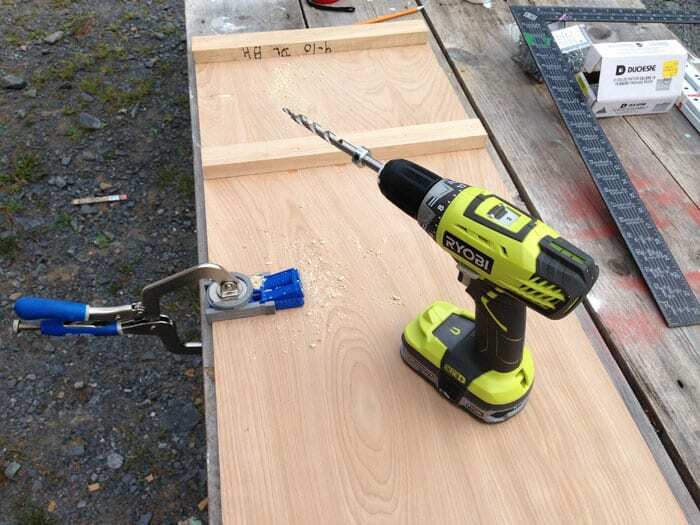 Invest in a Kreg Jig. This little pocket hole tool, made me feel like my furniture is sturdy and well built, and there isn’t visible screws everywhere. I have the small kit, it is less than a $50 investment that you’ll use 100’s of times. 7. Building your drawers a hair too small isn’t the end of the world. Because of the crap tape measure I had (see #4) I ended up building my drawer literally a hair too small. After I shook my fist, and thought about throwing the towel in, I realized I could just tweak the slides a bit. I slid a few washers in there and viola, perfect solution! 8. 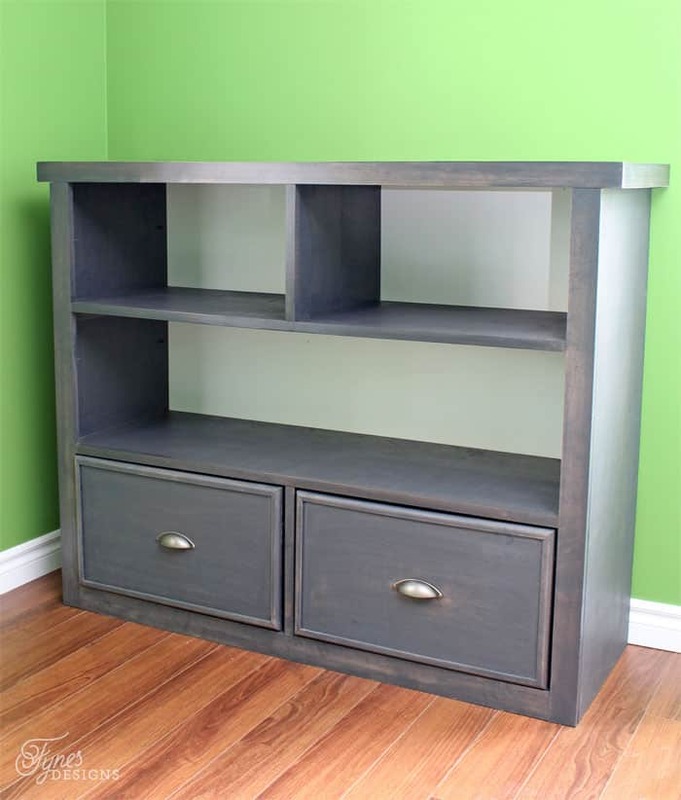 To paint or to stain? I ended up using some fairly nice wood, between the Purebond birch plywood I bought and some hardwood strips I had left from other projects, it made a pretty wood (and super solid) bookcase. After a lot of back and forth I went for a dark grey stain, and painted the back panel white. I’m sure it won’t take long for the shelves to fill. My son had a bookcase, dresser, and a mishmash of toy boxes in his room that we’re taking up a lot of space, and not being totally functional. 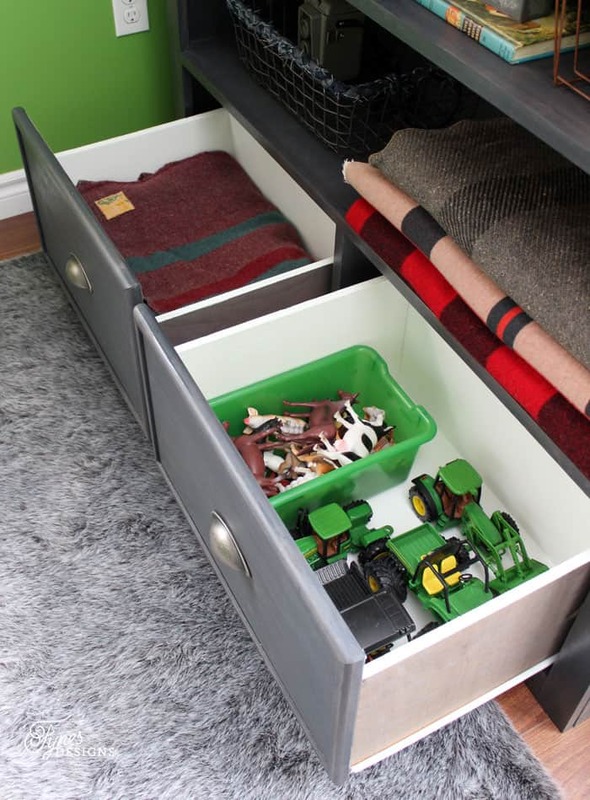 With this piece, one drawer can be for PJ’s and underwear and the other can be for a few toys. I haven’t exactly decided how we’ll use the shelf space. Probably baskets for books, and maybe space for his aquarium. I love that owning my own set of Ryobi tools. It has opened up a new world of possibilities for creating. I hate stressing how proud of myself I am, I didn’t build a rocket ship, it’s just a great feeling knowing I don’t have to depend on someone else or wait around to complete a project idea I have. Right now you can get your hands on some amazing tools too, Ryobi Days are on at the Home Depot Canada. Ryobi has everything from hedge trimmers to impact drivers and there are some exceptional deals going on right now. You can try your luck at winning a combo kit below valued over $500! 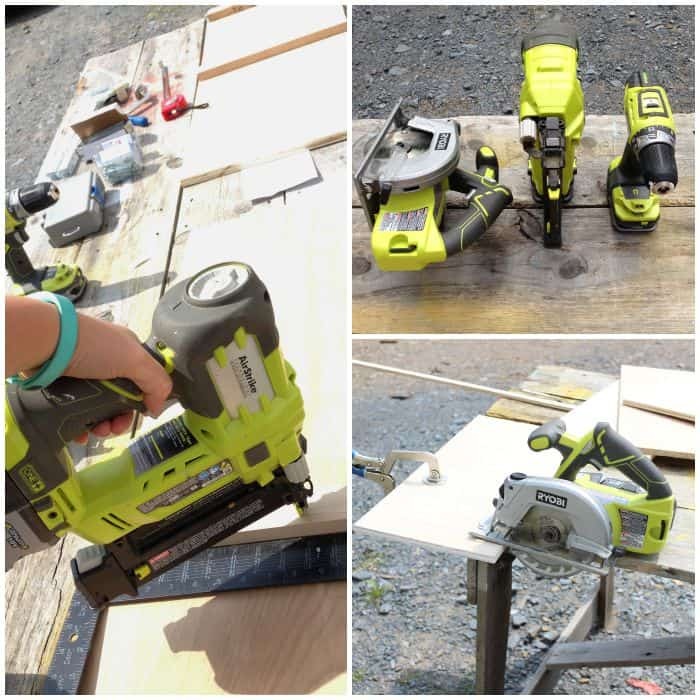 This post sponsored by Ryobi Canada. All thoughts and opinions are my own! You built your own drawers?! Amazing! I love how this project turned out. Everything from the construction to the staining and styling is perfection. Thanks so much Jen, it was a perfect first project, really built up my confidence in the wood shop! 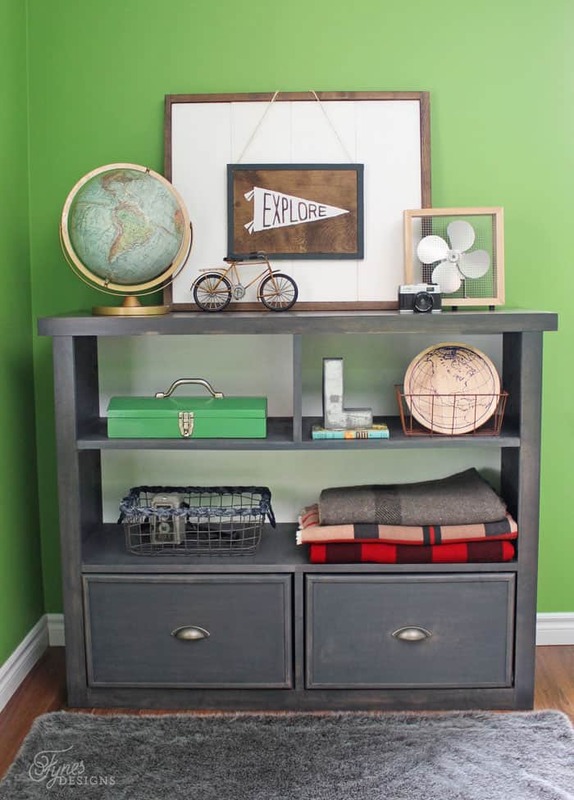 The bookcase looks fabulous – you did a great job! 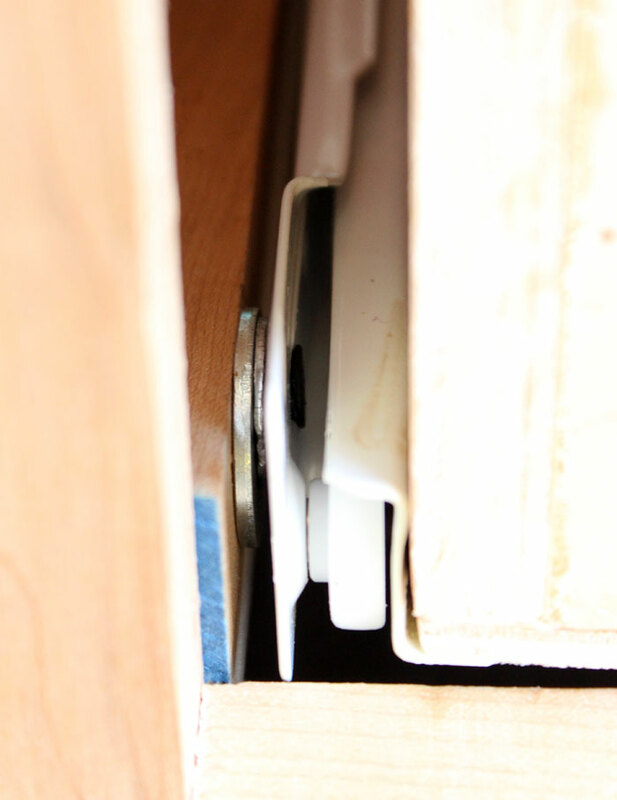 So glad the drawer front tutorial helped… Thank you for mentioning it! 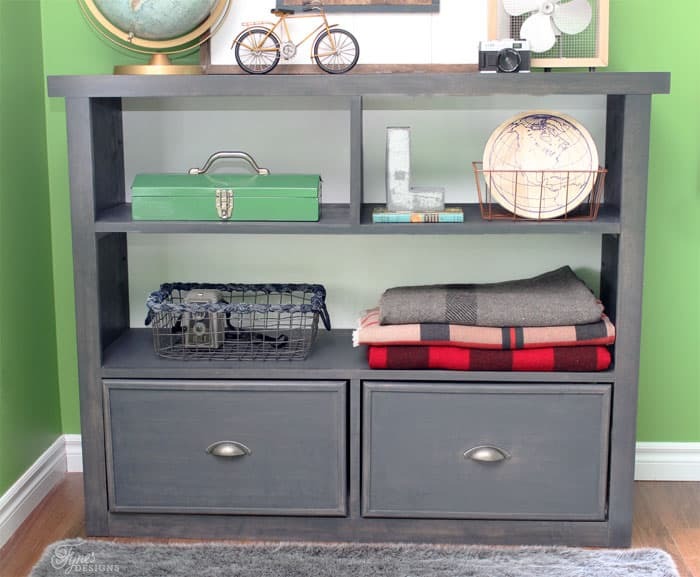 I need a couple of shelving units and your tutorial made it look easy! Adorable! I love the combination of shelves and drawers! The stain color is perfection! Wow, you did such a great job on this. Love that colour too! Wow! Virginia – this is amazing! You made this “from scratch”!?!?! I bow down to you, lady. You’re getting so good with power tools. Virginia you are amazing! 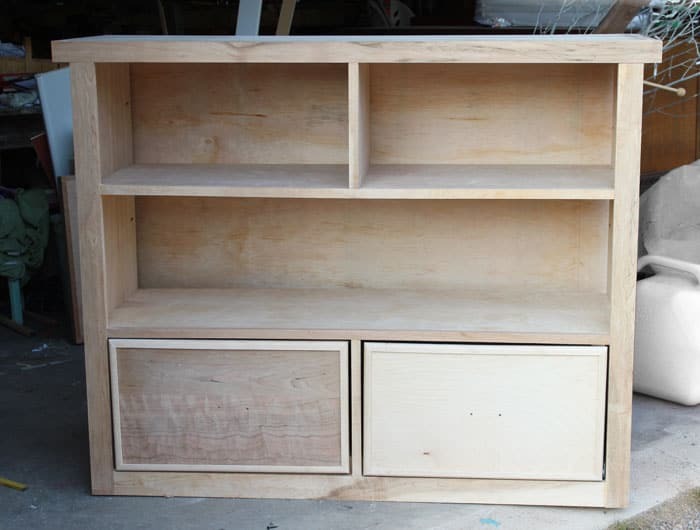 I could never imagine building a bookcase and drawers from scratch. It looks fantastic! I’d love to become Suzy Builder! Great work on these, Virginia. Sounds like you found some great tools in Ryobi! You should! I can’t believe I was so intimated of the tools. I should have tried it years ago! Very impressive! I love Ana White and have built a couple of things from her site but I haven’t attempted anything with drawers. You did a beautiful job! Thanks Charlene, drawers were as bad as I thought they would be. Maybe shouldn’t have been my first project. Only a little tinkering and they work awesome! Thanks lady!! You know I think the same of you, mmmmuah! You make it look so easy to make! It looks awesome, btw. Thanks for joining the Thursday Favorite Things Blog Hop! You are amazing with power tools!!! Talent is oozing from you! I love this piece you created and you made it look so easy! I would love it if you shared this project and any others you have done at my Making Broken Beautiful party. The party has started already but it goes each week from Thursday to saturday evenings! I hope you will join! You do lovely work! Love this piece!! Great job, it seriously looks so good and like a piece you would get at a high end store. Thanks so much Emmy, that really means a lot. It is working perfectly in his space!